Most hedge funds trading legally underperformed a simple balanced portfolio of index funds over the past 5-10 years. I want to stress here that there ARE some legitimate, outstanding hedge fund managers who garner fabulous returns for their wealthy clients. Fund fees are difficult to overcome. They charge 2% of assets under management + 20% of any profits…YIKES! No wonder index funds are so difficult to beat. You can get rich slowly but reject all get-rich-quick schemes. I think most of us already knew this but some still fall prey to these tactics. The fourth lesson is that when investing in the stock market we must ask ourselves the question: “What’s my edge”. In other words, what do I know that the market doesn’t? This last lesson initiated a few questions of my own. What is the edge of the Blue Collar Investor? Why is the BCI community growing so rapidly? Why do I have books of your generous testimonials describing success stories many of us never thought possible…what is our edge? Is the answer some deep, esoteric concept difficult to verbalize? On the contrary it is (much like our BCI system) NOT rocket science. Covered call writing, the BCI way, is the antithesis of any get-rich-quick scheme. We spend months educating ourselves and paper-trading to learn the methodology. We do our due-diligence before entering our positions. Risky stocks yielding huge returns are rejected. Some do fundamental analysis, others depend on technical analysis, we do both. Then we add several common sense parameters like avoiding earnings reports, diversification, strike price selection and others. Every step is throwing the odds in our favor, giving us a legitimate “edge”, not the kind Raj was using. We set up organized lists in our portfolio manager and prepare for possible exit strategy execution…the odds are getting better and better. Finally our cash is immediately re-invested unleashing the power of compounding. Think of the average, less-educated retail investor, think of us and then think of Raj. Which group will offer the best opportunity for financial independence? That, ladies and gentlemen, is a rhetorical question. There are many ways to make money in the stock market. The BCI approach to covered call writing is one way. Applying education, motivation and due-diligence to all methodologies is a road to success…there are no shortcuts. We are CEOs of our own money, independent thinkers not needing others for “hot stock tips”. We invest within our own personal risk tolerance comfort levels and are prepared with an arsenal of exit strategies should the trade turn against us. Finally, our profits are not left at the doorsteps of our local mall but are rather re-invested to unleash the 8th wonder of the world…compounding. In other words, we are educated, motivated investors. We do our due-diligence and are patient for our ultimate goals of becoming CEOs of our own money and financially independent. These principles apply to other forms of investing not just (my favorite) covered call writing. We are Blue Collar Investors…we will not get rich quickly but we will get rich! BCR was added to our premium watch list two weeks ago. It is in the Medical industry segment which has a ranking of “A”. Conservative investors may like this equity because of the low beta of 0.63 and dividend yield of 0.70. I will be a guest on Unlock Your Wealth Radio on June 4th @ 12:15 PM EST. I will be providing a link next week. I will be presenting a covered call seminar to the Long Island Stock Traders Group on Tuesday July 12th @ 7PM in Plainview, New York. The group allows non-members to attend at no charge. I will present a basic review of covered call writing and discuss the use of LEAPS options when buying high dividend yield stocks. Time will remain for questions on all aspects of covered call writing. I will post directions as the event approaches. The red arrows show a rising VIX and a declining S&P 500 while the blue arrows show the opposite, a falling VIX and a rising S&P 500. As volatility becomes more prevalent my percentage of in-the-money strikes increases. I was shocked when I heard the verdict. I thought for sure that his million dollar lawyers would get him off. After Madoff the SEC seems a lot more serious which is better for us little guys. What do you mean by “accredited investor” you mention in the first paragraph of this article? I am a bit surprised by the guilty verdict, but I haven’t heard the wiretap recordings, so he may have hung himself. I feel there is a fine line between “insider” information and information available to anyone who looks, but just hasn’t understood what he is looking at. For example, Bud Fox (Charlie Sheen) discovers that a major takeover mogul flies to a small town in Pennsylvania. He and Gordon Gecko (Michael Douglas) correctly infer that a takeover of a local steel company is in the works. Is that insider information? The airport employee knew where the plane was going. The FAA knew. The limo drivers knew. If I put two and two together and get four, and the next guy sees two twos, does that mean I need to tell him, “IT’S FOUR, YOU MORON!”, just so I can trade on it, and say it was public information? If I see 10,000 calls trade on a stock, and guess correctly that it’s being taken over, am I trading on insider information? What’s the difference between a steel industry analyst who does diligent research on the steel industry for a newsletter, and a steel industry analyst who does the same diligent research on the steel industry for three clients who are hedge funds, and pay a hefty fee for your research? I am sure there was some stuff on the tapes that swayed the jury. I am sure the guilty pleas of some of the other people involved didn’t help his case. However, insider trading is still difficult to define. As a matter of fact, the statutes do NOT define what actually IS insider trading. The company CFO telling his sister-in-law to buy a half million shares of his company, becuase it will be taken over next week, is hard to defend as being something other than insider trading. But having a collection of “industry experts” who only do research for you and a select group of private investment clients? Hmmmm, I don’t know. Maybe it is, maybe it isn’t. Martha Stewart was charged with insider trading, but the government failed to convict her of it. She was convicted of lying to federal investigators about the stock sale. She couldn’t argue stupidity, because she was, at one time, a stock broker. I don’t think anyone doubts it was insider trading, but, unlike Raj, she wasn’t convicted of it. Go figure. Personally, I’m feeling good that the SEC is taking a more aggressive stance since the Madoff disaster. The SEC wants big tuna not small fish. Here it is–6:47 pm on a Sunday nite and the new month of options starts tomorow. But I haven’t been able to get the new BCI premium download. When can I expect it so I can get to work. Thanks for your great service. Could you get it out on Sat. The Weekly Premium Report has been uploaded to the Premium Member site. to us to publish the reports with the highest level of accuracy so checking and rechecking the stats has to be factored in. That is why our posted commitment to our members is the report will be available before market open on Monday. WE HAVE NEVER MISSED THAT PROMISE. I can certainly understand and appreciate why our members would like to have this report as soon as possible. I would, as well, as it is the source I, too, use for all my covered call decisions. However we believe that there is NO service out there that gives this level of detail and screening on a weekly basis and the time we take to provide this information is well worth it. If we find ways to expedite the process without sacrificing the quality of the finished product we will be happy provide the reports at an earlier time but (I hope you agreee) we WILL NOT sacrifice the quality of the product we provide to our members by rushing the process. I am so proud of and thankful to my team for the time and effort they put in to generate these reports for me and our members. Thanks for your understanding and your generous remark about our service. In this weeks premium list BCR shows a down arrow for stochastics. Is this because it is in overbought territory? Yes…you’re right on. The stochastics is in overbought territory and crossed over to the downside of it’s signal line. The overbought condition is confirmed by th RSI as well. The MACD is looking like it is getting ready to cross over to the downside as well. With all this market volatility I was expecting higher option premiums for the June contracts but that doesn’t seem to be the case. Any ideas why? My opinion. The market has been rising for some time and there are a lot of excuses out there for it to fall or stagnate. You know the noise, Greece, oil prices, general economy, all the profits have come from cost cutting which can’t continue, etc. As the perceived upside potential gets reduced, the premium for call options will fall. The perfect examples are the MSFT calls and the PCLN calls. The odds of Microsoft suddenly jumping $5 are about as good as the odds of Apple filing for bankruptcy next week. On the other hand, Priceline is an unpredictable stock that can rise or fall $15 points for the heck of it. Option premiums are determined by a combination of perceived volatility and actual volatility, but usually for that particular stock, or its industry. The general market activity has a much smaller effect on individual calls than most people expect they would. One more possible reason in addition to Owen’s comments: Our 1-month contracts can be either 4 or 5 weeks. The June contract is the shorter of the two. We are also losing a trading day because on the Monday holiday. These factors will reduce the time value of the 0ptions and therefore our premiums. We should still be able to generate good returns even with in-the-money strikes. I ran across your Blue Collar Investor site about a month and a half ago. I signed up for the premium service and have been reading and learning a lot in the past month. Thank you for generously sharing your knowledge and experience with us! I am by no means new to the stock market and option trading, but I have yet to find consistent success. Typically my large returns have been offset (or more) by large losses. I am at a point where I am really ready for a much lower return in exchange for consistency. Your program seems perfectly suited for me. I have a question about how you recommend managing a stock that is going down. Obviously this is the one risk in selling covered calls. I have read your first book, but don’t yet have your second one on exit strategies. I expect that this book will have some answers for me, but I wonder if you could share some thoughts here as well. What are your trigger points for exiting a position? I would say that a change in the fundamentals of the company or industry would be a trigger. But barring that, do you use price as a trigger, such as being down a certain percentage? Or do the technical indicators give you a trigger to exit? Are there other factors to consider? In summary, for me this is the remaining question: Can I manage losing positions successfully so that my losses don’t eat my profits? 1- I use exit strategies EVERY month sometimes because a stock went down and sometimes because it went up past the strike price. The percentage is probably between 5-20% per month which includes rolling strategies on expiration Friday. 2- One of the specific guidelines I use is the 20%/10% guideline wherein I will buy back an option mid-contract if the option price is 20% or 10% of the original sale price depending on where in the contract cycle we are. This is a topic that requires much more information but I did want to respond albeit briefly. The date of the New York seminar presentation alluded to in the above article has been changed to July 12th, 7PM. It was originally posted as July 19th. On May 4th this company posted an outstanding 1st quarter earnings report, its 3rd consecutive “beat”. Revenues grew by 32% as the company bought back another 5.7M shares and authorizing another $300M worth of buybacks. The company trades at a forward PE of 18 and a stellar PEG of 1.0. Beware of a possible guidance update in June as alluded to at a recent Barclay’s conference. Positive guidance could send this equity even higher! Thank you for your reply. I appreciate the information you shared. As you said, this is a topic that requires much more information. I guess that is why you wrote a book on it. 🙂 I look forward to reading it soon. One thing that I wanted to clarify is that I am comfortable with using exit strategies regularly to managing my positions. I expect to be doing this monthly, whether to close positions early or to roll positions to the next month. These exit strategies are used to proactively manage positions that have been successful. – Maybe the stock is simply oscillating and will come back up. This may represent an opportunity to “hit a double” if the situation is recognized and acted on. If not this, then at least the original position can be successful if I am patient. – Maybe the stock is on a gradual decline. I may expect it to oscillate back up, but for some unrecognized reason it keeps trending down. In this case I would want to establish a stop loss point. This is tricky because a small stop loss may stop me out of many positions that I just need to be more patient in waiting for the stock to go back up. On the other hand a large stop loss will cause a large loss, but if it is very rare, then this may be best overall. – Maybe there was some surprise bad news announced and the stock dropped like a rock. In this case maybe I would just take my lumps and move on. This type of large loss which would need to be rare in order to not have the losses overwhelm the gains. I have found that it is much more difficult to make good decisions on losing trades because of the emotional response. Therefore I want to form a game plan that I am confident in to successfully handle these potentially losing trades. Note that I don’t expect you to address my concern in a blog reply. I just wanted to further express my concern with managing losing positions. You have been doing this successfully for years so obviously you have found a system to effectively manage the potential losers so that they don’t keep you from being very profitable overall. That is my goal as well. I also hope to find a system for success as I continue reading, learning, and papertrading. I am going to take a shot at answering your question because it is one of the most perplexing for many investors. Mark, just for the record I am like you. I traded options for more than thirty years with sporadic success, interspersed with dismal failures (GM and XRX). I took Alan’s seminar because he was successful, and I wanted to know what I was doing wrong. Among other things, what I was doing wrong was not properly selecting the stocks. What Alan teaches is how to pick the stocks with the best opportunity to make a small profit by selling covered calls. The other thing I learned was to use the next month calls. Sure, you can “bet” on the call six months out, but Alan has had consistent success sticking to the next month only. I am a big war movie fan. One of the things you learn watching war movies is the best path through a mine field is to step in the boot prints that you see going through the mine field. Alan gives us the screens he uses. Alan limits himself to next month’s calls. Step in his boot prints and you will be much more likely to keep both legs. Glad I could help. 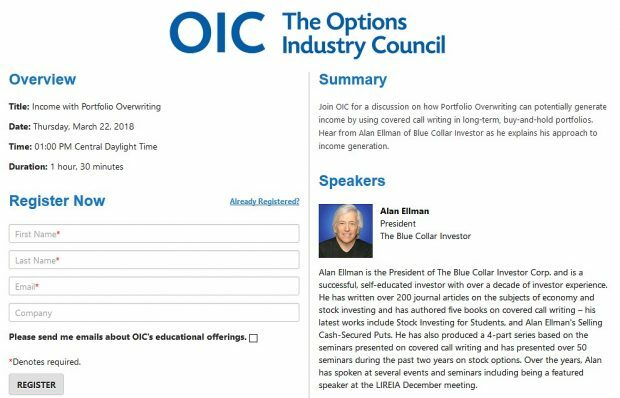 The whole purpose of the Blue Collar Investor program is to make covered calls less intimidating, but also to make the entire concept simple for the average kitchen table investor. Toward that end I try to help by offering humor, visual analogies, or any other tool that will help the BCI turn an extra profit from covered calls. I created the Excel calculator when I took Alan’s class. I am highly skilled with Excel, and I refuse to do repetitious calculations with paper and a hand calculator. Also, some of the students in the class were going glassy eyed trying to follow Alan’s calculation examples on a large flip pad. I did not want them to go home an put the program on the shelf simply because they were math challenged. Small investors must take the responsibility for their own financial well-being. They cannot afford a personal investment manager and they cannot afford to simply put their money in a bank CD and wait for retirement. Anything that encourages or enlightens them about being their own CFOs is a good thing. If anyone is inclined to try to make a few bucks off Linked In, tomorrow options will begin to trade on it. Personally, I’m going to be looking at the puts VERY hard. This is a VERY speculative stock, so don’t even think of playing it with money you want to continue to think is yours. I was thinking the same thing. I don’t think we’re alone. I enjoyed your answer to Mark. This is also, my problem.How many times in stocks, options and cover calls, I felt I could wait it out and the stock would regain its position. I notice you used a “kill it” point of 7.5%. Is this just made up for Mark’s example or do you really use this in your trades? I am trying to find a reasonable exit point for CC’s. Reported an outstanding 1st quarter earnings report on April 29th with revenue up 12% and earnings up 63% ahead of expectations. The average earnings surprise over the past 4 quarters has been a stellar 81%. AGP also repurchased 440,000 shares for $25M. Cash and equivalents rose to $909 M against $313M in total debt. As a result we have seen bullish price revisions. This stock trades at a reasonable PEG of 1.04. Looking at our premium watch list we see that AGP is in the MEDICAL industry segment which is ranked “A” the past two weeks and a beta of 0.80. Check to see if this financial soldier deserves a spot on your watch list. The 7.5% number was just for an example. It should be a number you feel comfortable with. If you have $100,000 to invest, 7.5% might feel ok, but won’t if you only have $10,000 to invest. I suggest you do a little paper trading. Select a trade you might normally do. Now, on paper, enter the trade three or four times. Set a loss cutoff of, say, 2.5%, 5% and 7.5%. If you hit the 2.5% cutoff, take the paper loss on the first trade. If you are down 5%, take it on the second trade. Would you feel comfortable with that loss? How quickly did you hit the 2.5%. Quite often a stock will backtrack a bit. Maybe 2.5% is too small a figure. Maybe 4% is better. It comes down to your pain threshhold. Find a number that you feel you don’t want to cross. Tack it up over your computer. It’s your line in the sand. Hope this helps. Happy trading. If you close a trade for a loss, DO NOT take on extra risk on the next trade in an attempt to make up for the loss. Sometimes it is difficult to, but you MUST stick to your trading strategy. Going for the 5% gain, or doubling your next investment on a single stock, is NOT the solution. It may actually add to your loss. Here’s another visual analogy, because Bill likes them. It’s a shooting gallery. You take a shot. You hit the target, you miss the target, but you do not climb over the counter and chase the target. Hopefully, when the month is over, you have knocked down more targets than you missed, and you get to take home the giant panda. Even if you only win the smaller stuffed animal, you’re still coming out ahead. Sorry, that visual was for Mark, not Bill. I picture the shooting gallery where the targets are moving across the gallery in rows, some row moving left to right, and some moving right to left. It is best to simply aim straight in front and shoot as the targets go by. But the game tries to sucker you into chasing targets that you miss, or ones with a higher point value moving in the other direction. In the end you will be best rewarded if you keep your focus straight in front of you.